2017–18: Made her collegiate debut on Oct. 6 vs. Boston University. Before NU: Attended Nazareth Academy and played hockey for the Chicago Mission and head coach Tony Cachey…helped the club to five league championships and six Illinois state titles, while leading the team in scoring four times…guided the Mission to three National Championship bronze medal finishes, as well as an appearance in the USA Hockey Nationals Tier I 19U title game in 2017…invited to USA Hockey National Select 66 Camp in 2015-16 and USA Hockey National Camp from 2012-14. 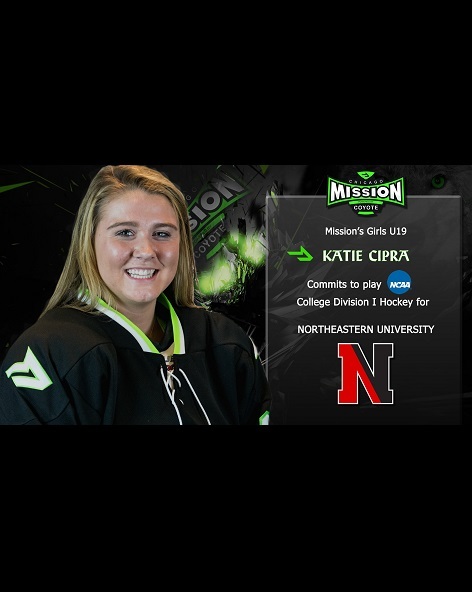 Personal: Kathryn Anne Cipra…goes by Katie or K-Cips…daughter of Jay and Molly Cipra…father played ice hockey at the University of Denver…has three sisters…enjoys skiing, boating and traveling…undecided as to her major but aspires to work in communications or psychology.